The Barber Dime continued from 1892 through 1916, despite many complaints from collectors for its perceived lackadaisical design. The year 1916 saw sweeping changes in United States coinage, including a new dime. A.A. Weinman designed Liberty adorned in a winged cap, symbolizing freedom of thought. Surprisingly, the image was widely mistaken as Mercury, the Roman messenger god. Weinman also created the Walking Liberty Half Dollar. The new coin was intended to be called the Winged Head Liberty dime, but the moniker "Mercury" stuck, and will forever be attached to this popular collector dime. To my mind it does not require very artistic efforts to excel the old issue. The new issue is indeed a welcome addition to our coinage, and one which I think will meet with the approval of thinking numismatists. We have in the new United States dime... the handsomest American coin... so, after years of waiting and not a little agitation, in which I claim a share, we have here a coin which is second to none we have issued, and it will compare favorably with any in Europe, which is saying much. As Europe was being consumed by war in 1916, the reverse of the Mercury Dime illustrated themes that were important to Americans: A battle-ax to signify military readiness, placed next to an olive branch to express hope for peace. The Mercury Dime remained a fixture in American culture for many years, a faithful companion through two world wars and the Great Depression. Following the death of Franklin Roosevelt in 1945, a new dime bearing his likeness was designed and released the following year. With that, the Mercury Dime was relegated to the history books, but remains foremost in the hearts of today's coin collectors. All three of the Mercury Dimes pictured above are high grade Mint State specimens. The dime on the left is an example of no separation between the center horizontal bands on the reverse. The center photo shows some separation of the bands. In the right photo, the bands are fully separated and earn the designation "Full Split Bands". The degree of separation is a function of die wear. Mercury Dimes struck by fresh dies typically exhibit the "FSB" effect. As the dies wore down, the band split became less pronounced or non-existent. "FSB" dimes are relatively scarce compared to the overall population of Mercury Dimes, and are often worth substantial premiums over their more common counterparts. For mint state Mercury Dimes in general, the horizontal bands holding together the rods on Weinman's reverse fasces feature, if fully separated and rounded, can generate prices far above less distinctive specimens of the same date and mintmark. Full Split Bands (abbreviated "FSB") resulted from striking by fresh dies, and are generally much rarer than blended, flattened bands. Key date Mercury Dimes for sale are offered below. 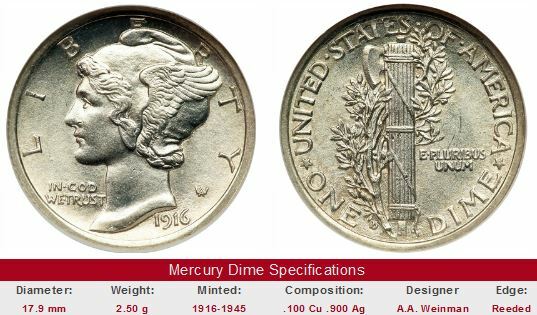 The "View All" link in the lower right hand side of each "Sales Box" will bring up all the selected key date Mercury Dimes, if any, available right now on eBay coin auctions. The left hand side of the box illustrates value trend data over a very long period of time for the coin in VG-8 condition. The percent annual increase is computed for comparative purposes. Don't buy key dates in this or any other coins series unless they've been certified by PCGS, NGC, ANACS, or ICG, or are being sold by a reputable dealer. The coin pictured for sale in the right hand side is not necessarily an example in VG-8 condition.